Chesters is well-signposted on the B6318 Military Road travelling from both the east and west. The English Heritage car park immediately east of Chesters fort is primarily designed for visitors to that monument. That much is clear from the fact that you can get the cost of your parking (£3 in 2015 according to the EH website) reimbursed when you visit the fort. 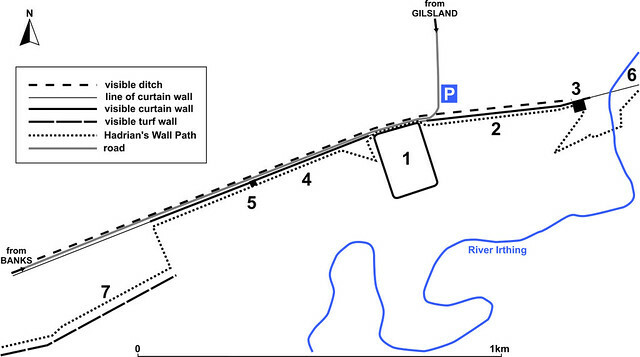 However, you can also use it as the starting point for for a short walk to explore the bridge abutment over the river (although there is another, closer, alternative). As ever, be aware that there are car thieves operating, as there are at all of the car parks along the Wall. To get to the bridge abutment, leave the car park and walk back to the main road. Cross over (taking care of course) and, turning right, follow the pavement to the roundabout at Chollerford. Go across the bridge over the North Tyne and then turn right into the small pedestrian gate immediately east of the bridge. Go down the steps and then follow the footpath to the pair of kissing gates, and then down to the riverside where the bridge abutment is situated. Stout footwear is not necessary but is advisable. Carrawburgh car park is immediately next to the B6318 (the Military Road) so is pretty much impossible to miss, whether travelling from the east or west. 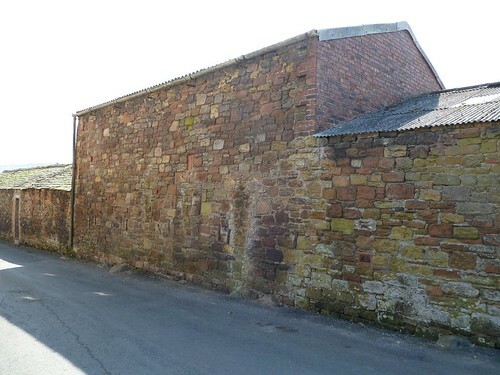 It is another of the Northumberland National Park car parks for which a season ticket can be acquired; an ordinary ticket bought from the machine here can be used on that day at any of the other National Park car parks along the Wall. Always be aware of the possibility of thieves operating in the car park. 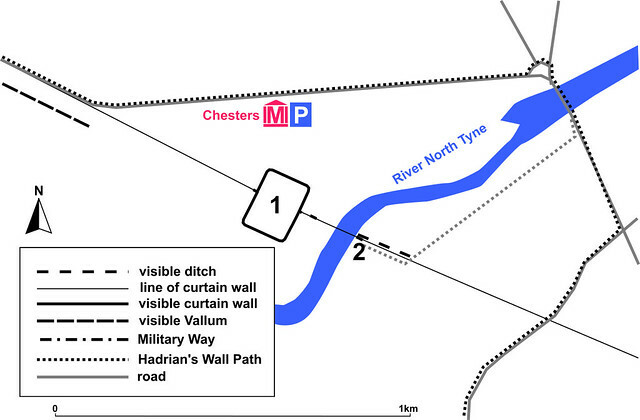 Follow signs for the Hadrian’s Wall Path to access sites to either side of Carrawburgh. Stout footwear is advisable. Access to the fort and museum is by a paved path. 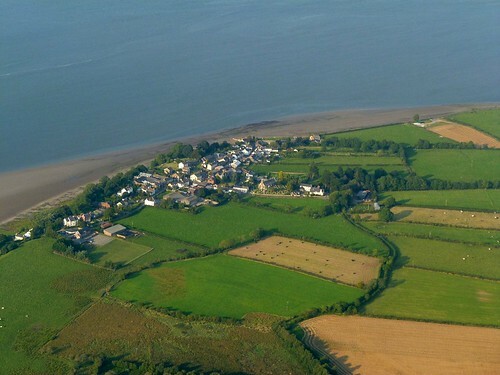 We continue into the village of Drumburgh, leaving the marsh behind us. 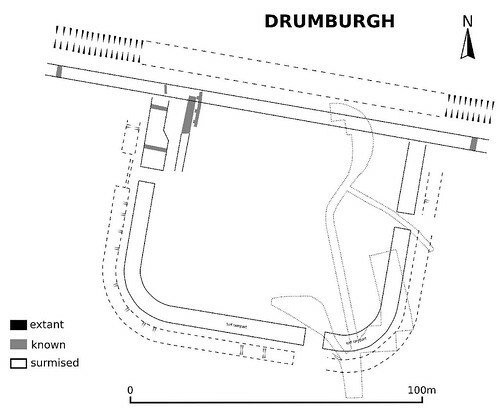 Drumburgh fort, like Bowness, was situated on a drumlinoid, giving it a slight height advantage over the surrounding area. Note that it is another of those burghs pronounced ‘bruff’. There is nothing of the fort to see, but Drumburgh Castle (in reality a fortified bastle-type house typical of the border region) contains large amounts of dressed red sandstone; the Revd John Leland visited in 1539 and had little doubt about its origin, commenting ‘the stones of the Pict wall wer pulled down to build Drumbuygh for the wal is very nere it’. 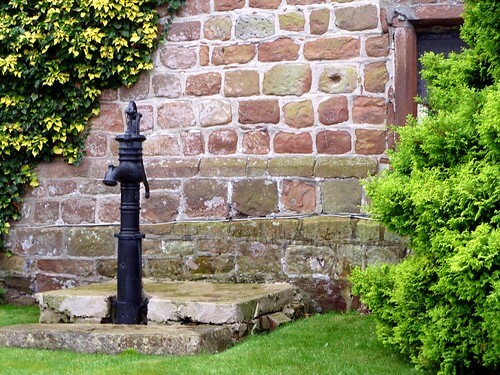 From the road, we can clearly see what appears to be a plinth course behind an old water pump, almost identical to those found on the northern face of Turf Wall turrets like T52a (you will recall that I pointed it out to you. No? Oh well…). 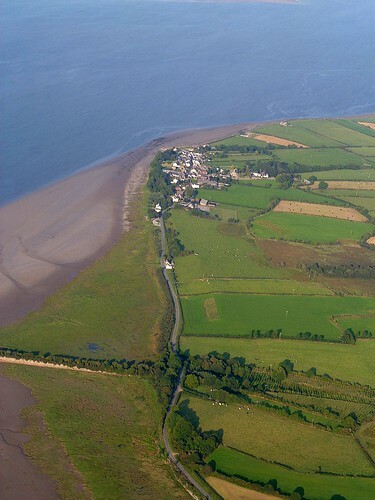 Richard de Broyne was granted a licence to crenelate his property on August 24th 1307 by Edward II (Edward I had died of dysentery nearby on July 7th and this was one of three Cumbrian licences granted on the same day). Belonging to and evidently renovated by the Dacre family in the 16th century (the coat of arms of Thomas, Lord Dacre, is over the entrance), it has the defensible raised doorways found on such structures throughout the Border Marches, recalling how the livestock would be kept on the ground floor whilst the humans inhabited the storeys above. At this point, it is worth noting that another of the Dacres has an intriguing role to play in the later history of the Wall, suggesting rebuilding it to Elizabeth I in order to keep out the Scots. 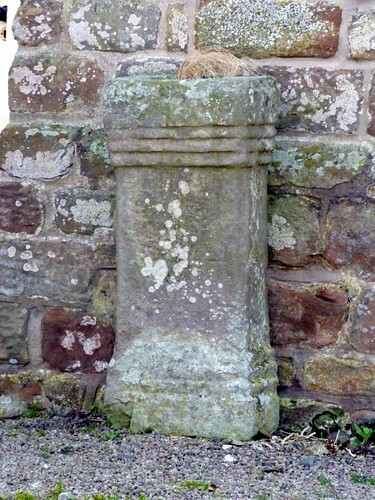 Outside the Castle are a number of Roman altars which, when Jessie Mothersole was here in 1921, were regularly coated in a strange mixture of buttermilk and ochre to help preserve them. 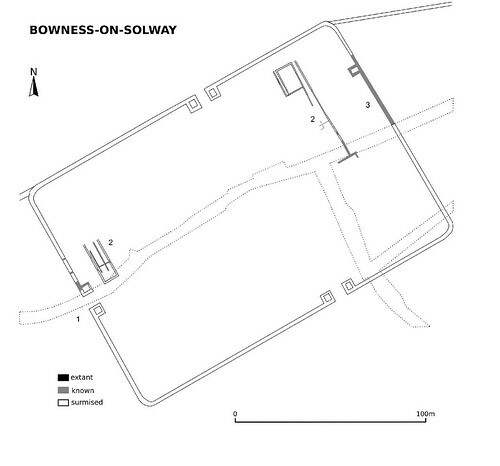 At only 0.8ha (2 acres), the fort was too small to have housed a complete quingenary cohort, although the Notitia Dignitatum identified its late garrison as cohors II Lingonum. Excavation in 1899 showed that the fort wall was bonded with the intermediate-width stone curtain of the Wall (and so built at the same time). Shortly after the castle, we turn left down a narrow lane, immediately opposite a conveniently provided public convenience (rejoice: another one!). 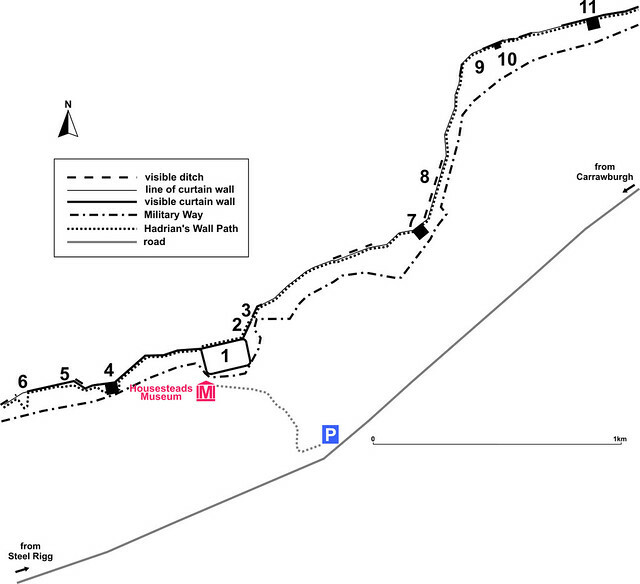 We are heading off on one of the largest diversions from the course of Hadrian’s Wall. 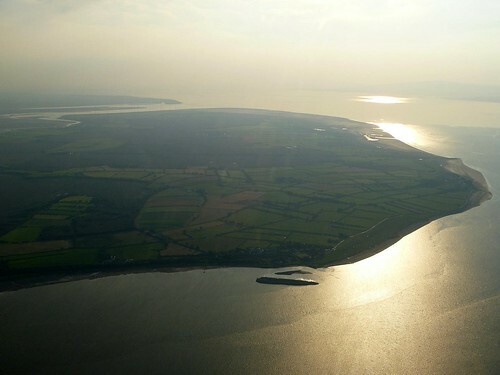 Consequently, nothing much interesting happens between Drumburgh and Glasson if we stick to the Trail, although it is a pleasant enough walk, but patrolled by some mean horseflies. Some insect repellent is advisable (although I sometimes feel a 40mm Bofors gun might be more effective). The Wall, meanwhile, has realigned itself twice and is out of your reach, in the fields to the north. 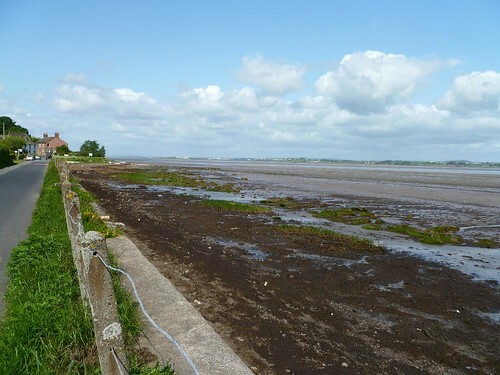 Railway enthusiasts and industrial archaeologists may care to note that the Trail leaves Drmuburgh on the route of the dismantled Carlisle and Silloth Bay railway, leading south from a junction with the Port Carlisle line at the station just east of Drumburgh. In 1954, it apparently had the distinction of being the first line in Britain to replace steam trains with diesel multiple units; it shut ten years later. Far be it from me to draw any conclusions from that coincidence of facts. 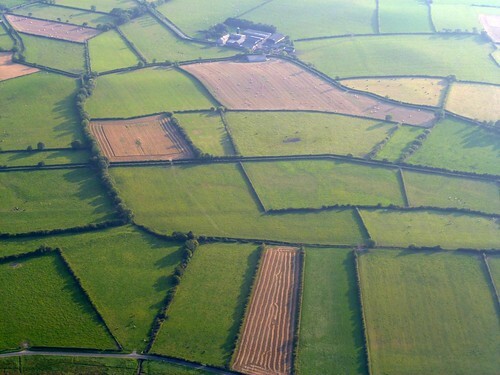 If you (mischievous person that you are) wish to be slightly wayward and see the location of Milecastle 77, then once we reach Glasson (there are no remains so don’t get too excited), you will need to carry straight on down the road onto which we have turned, keeping the Highland Laddie Inn to our right and the village green to our left. You then follow the road for 0.4km to the T-junction (crossing over the line of the dismantled railway as you go), where the Wall is directly under the road; the milecastle lies 40m to the east, under the verge. Appreciate the lie of the land; note that you appear to be on another low drumlinoid and, if it is a fine day, to the east you can just about make out the higher ground of the Central Sector as the Wall climbs up towards Carvoran. Feeling nostalgic for the lumpy bits already? This milecastle was excavated in 1973 and (according to which version of the Handbook you read) either found or not found. This is why archaeologists are so fond of the words ‘probably’, ‘perhaps’, and ‘might’. 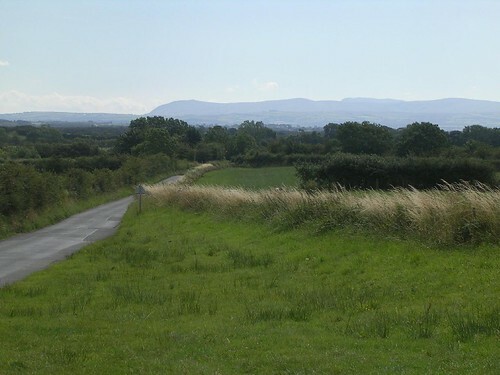 Anyway, you have now seen the site of the milecastle and can rejoin us in Glasson on the comparative safety of the National Trail and its idiosyncratic wanderings across the Cumbrian countryside.